myCareer is Dalhousie's online recruiting database that employers use to post jobs, review applications, schedule interviews, and offer jobs to students. If you are a new employer, you can set up an account to access myCareer. Visit the myCareer Registration page. Enter your details in the online form. Select Submit Registration. You will receive an email confirming that your account is pending approval. Once your myCareer account is ready, you will receive another email notification. Now, simply login to the Employer section using the email and password you supplied to begin recruiting Dalhousie students. Forgot your password? Reset your password manually using the email address you provided (which also serves as your myCareer login ID). Visit the myCareer Forgot Password page. Complete Step 1 on the Forgot Password tab. Your password reset code will be emailed to you. Once you receive the password rest code, proceed to Step 2 in the Forgot Password tab and follow the instructions to reset your password. If you require further assistance, please contact us at coopjobs@dal.ca or 902-494-4353. Complete the online form to create your job posting. Remove contact details you do not wish to display in the job posting. Please leave your name / title for students to address their cover letters. Email addresses and phone numbers are never visible to students. Copy-paste your Job Description and Requirements (qualifications). To collect applications outside of myCareer, include instructions for applying through your email or website. Select the required Co-op Application Documents. Enter any additional details in the Additional Application Information. Check this information carefully and add or delete information as needed to customize or update the new version of your job posting. Click on the Submit Posting for Approval at the very bottom of the page. Your job will be visible to students once it has been approved. 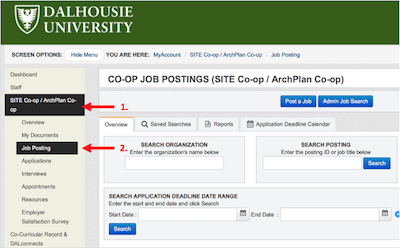 In the left hand menu, select the SITE Co-op / ArchPlan Co-op section, followed by the Applications subsection. Your job postings are displayed in chronological order (oldest appear at the top). Find the job posting for which you'd like to review the applicants, and select that job posting. You are now in the Applications section for the job posting you selected. Individually: click the PDF icon. Application Bundle: to view multiple applications as a package: select the applications you wish to review by checking beside that student’s name. Next, click Create an Application Bundle. You may then download the package and send to another contact through email. Identify the job posting for which you wish to arrange interviews and select View beside the job details, or select the job posting title and then select View Applications. Using the dropdown menu beside each candidate’s name, choose Selected for Interview or Not Selected for Interview. Once your selection is ready, click Submit. In the left hand menu, select the SITE Co-op / ArchPlan Co-op section, followed by the Interviews subsection. Find the job posting for which you wish to schedule interviews, and select that job posting. 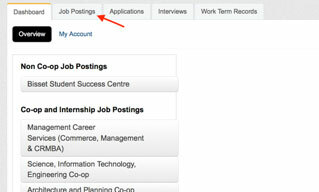 Select the Interviews tab for the job posting you selected, and select Request Interview Date(s). Follow the prompts from the Interview Wizard to complete your interview schedule request. Allocate enough interview slots for the number of applicants you choose to interview. If you need multiple days to interview, click Add a Day. You may select any schedule breaks, and give the break a description with a start time and length. Pending: interviews are awaiting staff confirmation. Open: students may view the schedule and select time slots. Scheduled: you may view the completed schedule. Once the interview status is listed as Scheduled, click View Schedule beside the interview details. From this screen you can see what slots each student selected, and print the interview schedule.